Thanks to thecontrail.com for this link, & no not new news but a reminder of how money speaks (Thiel being Paypal’s founder) in our neo-lib ‘paradise down under’. Peter Thiel is building a panic room in his New Zealand property, and it could be a sign that he’s part of a growing number of American millionaires choosing New Zealand as their Doomsday destination. Last year it emerged the billionaire venture capitalist and co-founder of Paypal was granted New Zealand citizenship in 2011. Thiel visited the country just three times for a grand total of 12 days before his citizenship was granted. New Zealand citizenship rules normally require an applicants to be a permanent resident for 1,350 days in the five years preceding an application. During his few visits he met four senior members of the Cabinet, including the Prime Minister. Following public backlash, authorities who oversaw the citizenship defended their decision to give Thiel citizenship by saying he had been “a great ambassador and salesperson” for the country. He told Business Insider in 2011 he found “utopia” in New Zealandand already had two noteworthy venture investments in Xero and Pacific Fibre. Despite saying that he had no plans to reside in New Zealand after gaining citizenship, and that he’d rather be “an enthusiastic supporter of the country,” the billionaire went on to make a number of real estate purchases. In 2011 he bought a four-bedroom home in Queenstown for $NZ4.8 million. And in 2015 he bought a 193-hectare block in Wanaka (the area used for the mountains in Lord of the Rings) for $NZ13.5 million. He did not need to follow foreign buyers rules for the sales because he was a citizen. While the land from the second purchase still remains undeveloped, it’s Thiel’s Queenstown property that is most intriguing. After suffering a serious fire last year, causing more than $NZ500,000 in damage, Thiel used the opportunity to repurpose a walk-in closet — into a panic room. The new design is laid out in building consents for the repairs filed with the Queenstown Lakes District Council in May, according to the Herald. There have been numerous reports over the years about some of America’s wealthiest people buying property in New Zealand so that they have somewhere to flee in the event of a global catastrophe. Buying a house in New Zealand has become a sort of code for getting “apocalypse insurance,” as Reid Hoffman, co-founder of LinkedIn puts it to the New Yorker last year. “Saying you’re ‘buying a house in New Zealand’ is kind of a wink, wink, say no more,” he said. While some have previously pointed to New Zealand as Thiel’s “back up country”, he has not ever confirmed it. This latest development however sure looks like he is preparing his Doomsday bunker for Armageddon. With failed talks in Hawaii recently with regards to the free trade agreement, Kiwis turned out en masse today in many parts of the country to protest the whole deal that has thus far been carried out in secret. Ostensibly a free trade deal, it is a doorway that will give corporations open slather to sue us if we threaten their profit making margins … something they are already doing in other countries. Educate yourself on this issue … it is important. Here are links to various news reports throughout the country. In Auckland thousands of protesters turned out in the rain to march from Aotea Square down Queen Street. Further south in Christchurch thousands of people turned out in the wet at Hagley Park to march up Riccarton Road, medical students, teachers and marketing executives among the crowd. 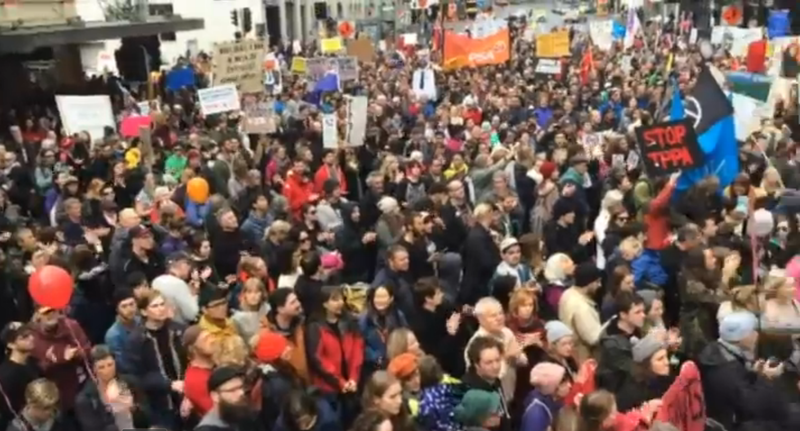 In Otago a large group of protesters marched through Dunedin’s CBD. Protests today end an action week by those opposed to the proposed deal. Rallies were also planned in Wellington, Kataia, Hokianga, Whangarei, Hamilton, Colville, Tauranga, Whakatane, Napier, New Plymouth, Featherston, Nelson, Timaru, Little River and Invercargill. The biggest Bank heist ever! Here is some enlightening weekend viewing. Learn why our respective nations have undergone such radical changes in recent decades. The oldies among us will tell you this. Things are not as they were. New Zealand has changed dramatically since the late ’80s when the new neo liberal economic policies called Rogernomics set in. We are now the reapers of that earlier Government’s folly, and paying a price. Where once we had full employment and no debt, we are now in debt … big time (climbing $27 million per day) and subject to the control of big business. Borrowing millions per week to stay afloat? Our grandparents must be turning in their graves. 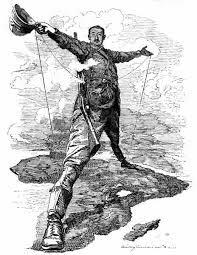 That was the unfortunate ‘NZ Experiment’ that sold us down the river, and with our assets now going … going … gone, we no longer enjoy the sovereignty we once had. They sold off our family silver as it were under the fancy name of ‘privatization’. (A new term, note, that gives a professional air and shifts the focus off what is really happening). We were told it was to pay our national debt but we are now more in debt than ever … it clearly hasn’t worked. Our country is now a corporation registered with the Securities and Exchange Commission (SEC) and our government departments likewise. There is your clue. Corporations have one bottom line: PROFITS. So ‘filthy lucre’ if you like was uppermost back then as well … the driving motive for expansion to other shores was not as we’ve been led to believe … to bring civilization and Christianity … these were merely by-products. With this corporatisation everything began to operate on a business model, and instead of people with related background experience matching the kind of government department they served, we saw people appointed with purely business skills. Their focus became figures and profitability, not people, so social service and health departments were required to predict their costs in advance based on historical data. Quite a feat when dealing for instance with child abuse. Government departments were subjected to restructuring (the new catch word given to the changes … known also in other countries by other names like ‘structural adjustment’) and told it was so they could all work smarter. In fact, where I worked at the time, I likened it to musical chairs. When the music stopped there were less bums on seats in the office. And the music kept playing, and the seats kept disappearing. The folks on the ground inherited more work from their now absent colleagues, and the CEOs inherited fatter salaries to ensure (I suspect) the new status quo remained. It was a classic case of smoke and mirrors and happened across the board. Friends of mine in other professions complained of being buried in mountains of new paper requirements, the face of their jobs completely changing, and leaving less time for people. So now we see evidence of this business model everywhere, with their whole raison d’etre being profits, while the memory of a caring welfare state is becoming more and more elusive by the year. In rural communities it still sticks out like a sore toe because it clashes with their longtime ethic of community and caring. On that note, as you ponder on the origins of our (and many other countries’) demise into the debt abyss … grasp an overview of the root cause of these problems in ‘The Biggest Bank Heist Ever’. It is all about making money, the big fishes eating the little fishes. Remember, it is a mythical illusion that all can succeed under capitalism. Wakefield himself of the NZ Company openly stated that they would keep the price of land high enough so that not all could own any (1). Video info: “The award winning documentary ‘Inside Job’ [2011 | US] by the veteran crusader, Charles Ferguson is the most insightful and illuminating amongst a number of such attempts that deal with the global financial crisis, which is wrecking lives and economies across the world to this day. The reason is that it successfully challenges the myths and lies surrounding the root causes of the crisis and tells us exactly how and why it happened, in a simple and straightforward way that anyone can understand. “The Trans-Pacific Partnership trade pact does not yet include an acceptable deal on access for New Zealand’s most important exports, dairy products, with little more than a month to go before the controversial 12- nation trade deal could be concluded. For further information on the TPPA and how it will affect NZ if signed, visit the TPPA page on this site.